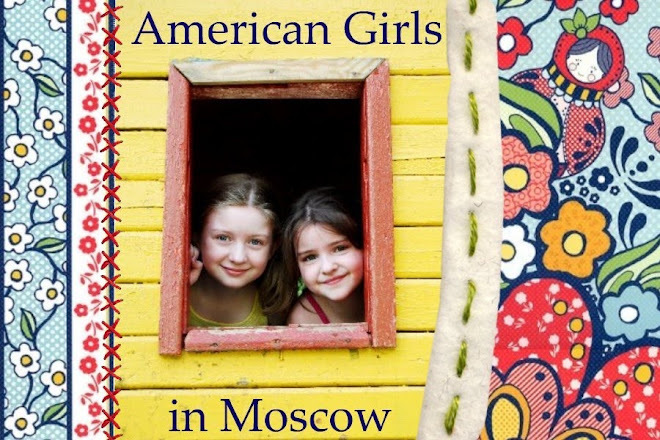 American Girls in Moscow: Звуки Музыки... The Sound of Music! "The Moscow streets are alive... with the sound of music..."
Yes, yes, the new musical for this year at THE theater for musicals is "The Sound of Music"! When we first saw the billboards advertising it upon our return to Moscow in August, the girls and I literally shrieked with glee! The premiere was last weekend; we'll go sometime soon. I can't wait to see how they've translated the songs and how the movie is reworked on stage... The Russian stage version will also be different from how it was presented on Broadway; the Russian production team was granted permission to tweak it according to their vision. So far I think the translation of Do-Re-Mi is neat; they picked entirely different images to illustrate the notes... "So" is for "solomka" laying on the table (pretzel sticks--a neat choice since it works in both Russian and Austrian culture). I'd love to see that on stage. 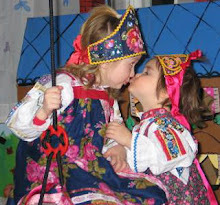 Last fall I met 4 of Maria's great grandchildren when they performed at Yankee Candle and the girls wear Maria's dirndl dresses. I did buy the CD. I hope you will go and see it and tell us how it really is. Oh, I love the translation of The Sound of Music to Hungarian! It, too, deviates from the English original in Do, Re, Mi. :) What I liked about the show in Budapest was that they didn't try to look like the film, just did their own thing: Maria had curly black hair!